On March 1, 1909 my grandma was born. I loved her comfort foods. She could even make a meatloaf sandwich taste amazing. She always had home baked bread and strawberry jam in her freezer. For breakfast she would fry cheese until the edges were crispy and we would twirl the melted cheese onto our fork and crunch on the crispy edges. Grandma would sautee vine ripe tomatoes in about a pound of butter and pour it over her toasted homemade bread. She called them fried tomatoes, but they were more like stewed tomatoes swimming in butter. They were the most memorable breakfasts. Last year I posted her Chocolate cake recipe, which I generally bake every year on March 1st in her honor. This year I decided to make her a pie. 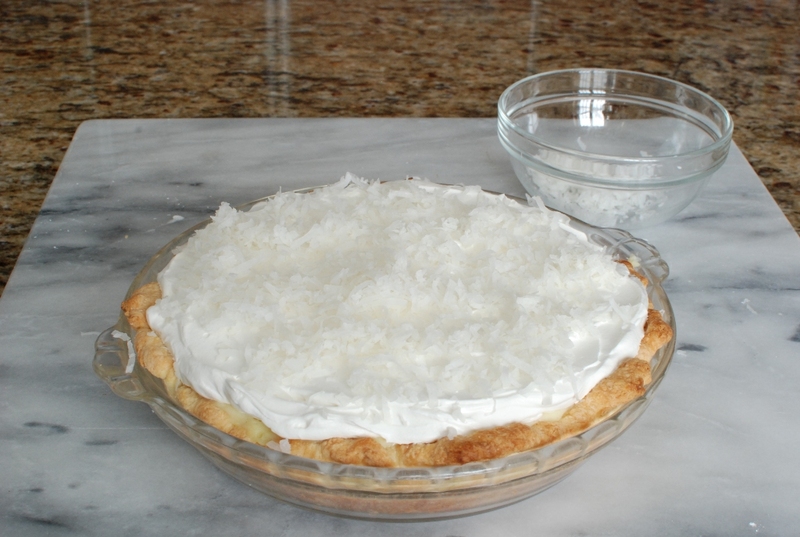 Whenever I think of my grandma, the first thing that comes to my mind was her Coconut Cream Pie followed by a sigh. It was so simple yet divine. 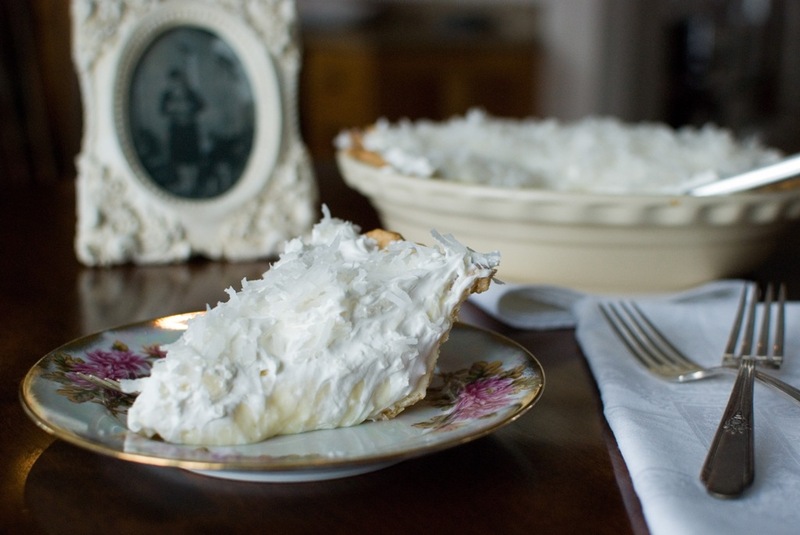 Coconut Cream Pie as endearing as grandma herself. 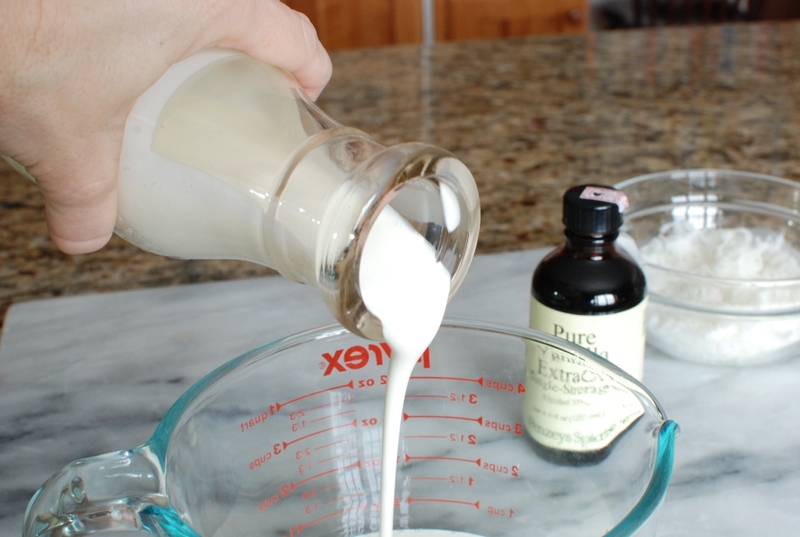 Add the 2 1/2 cups cold milk. 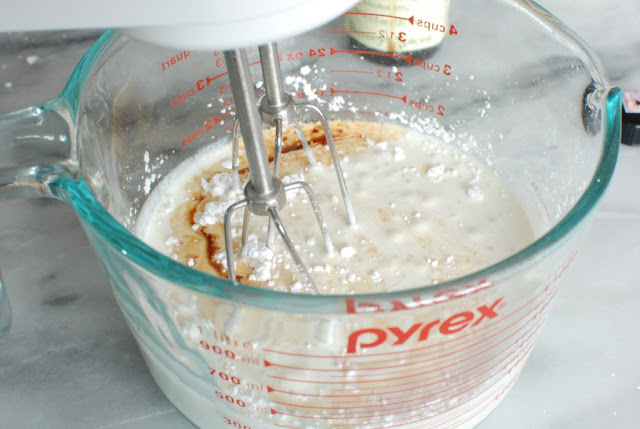 Whisk the mixture together and cook over medium heat. When the milk sugar mixture begins to thicken, slowly add the hot mixture into the eggs on spoonful at a time. 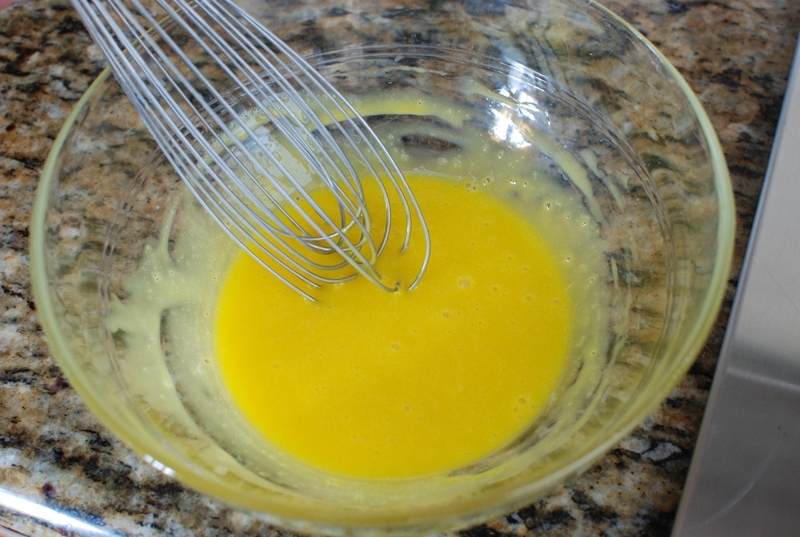 Add about 1/3 of the hot mixture to the egg yolks. 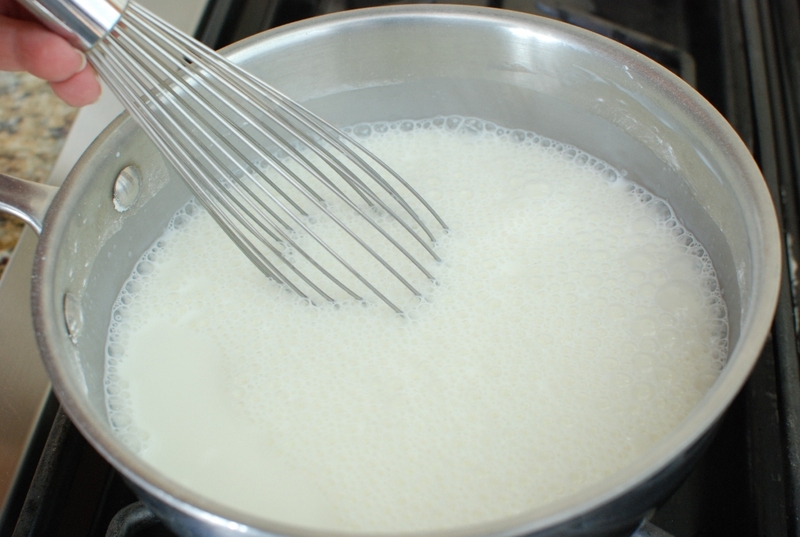 This tempers the eggs so that when they are added to the hot milk mixture they won’t cook. 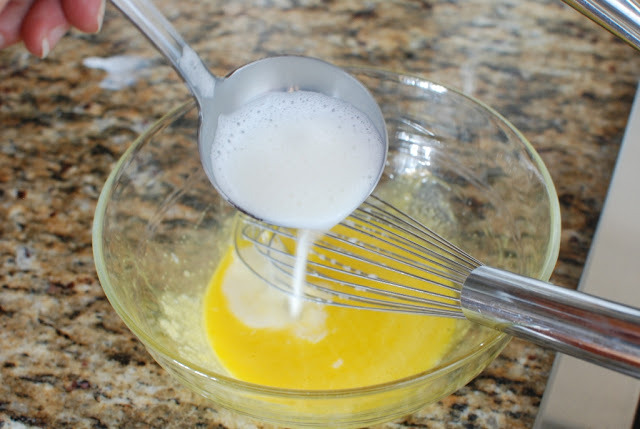 That way you don’t end up with scrambled egg yolks in your cream pie filling. 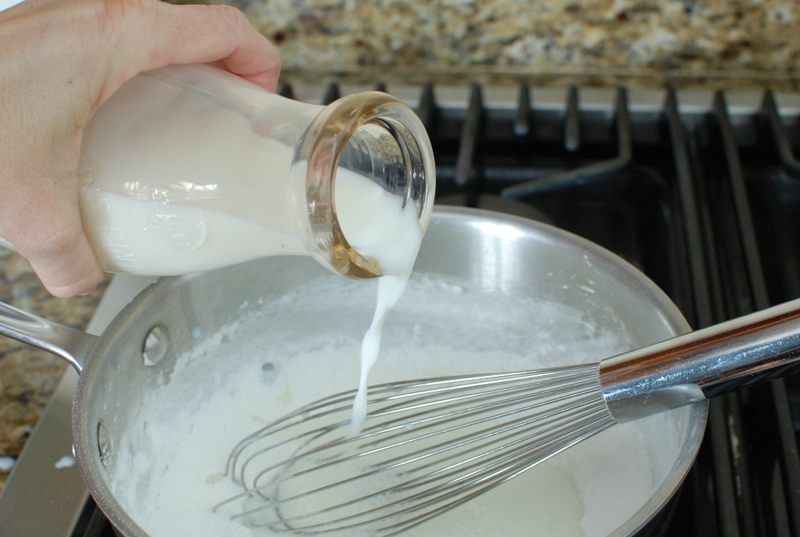 Slowly add the egg mixture back into the hot milk stirring constantly. 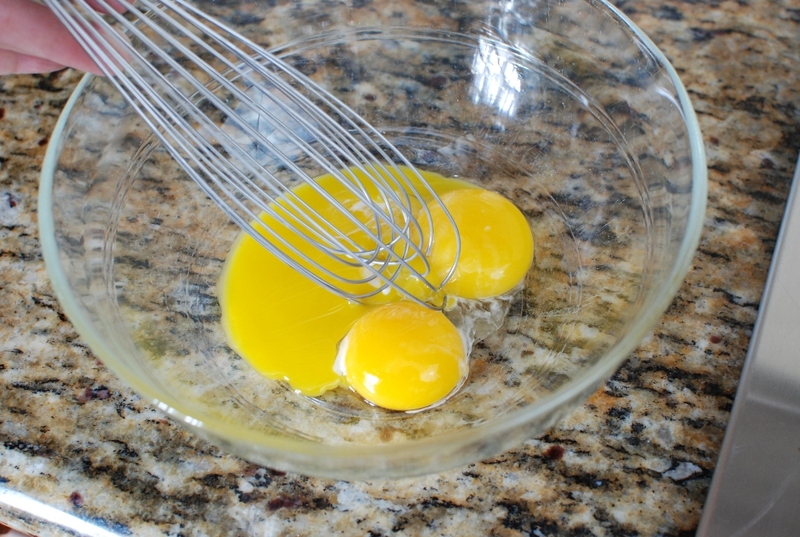 Cook for an additional 2 minutes to make sure the egg yolks are completely cooked. 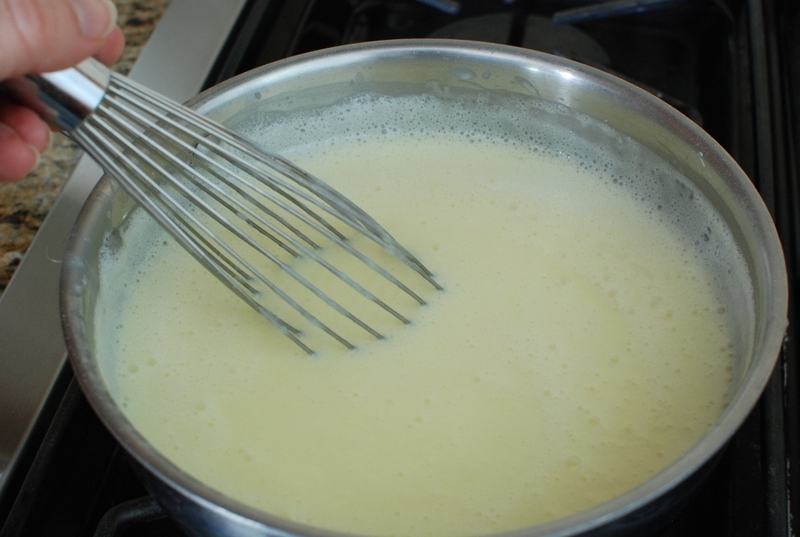 Stir constantly so the custard does not scorch or burn on the bottom of the pan. 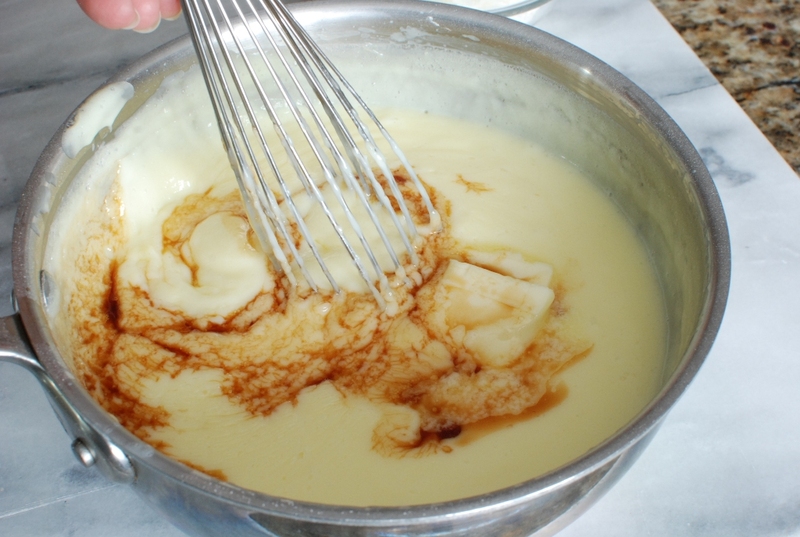 Cook until the mixture is quite thick. Add 1/2 cup coconut. Reserve the remaining coconut for the topping. Make sure the pie shell has completely cooled. Place a piece of plastic wrap directly to the top of the custard. 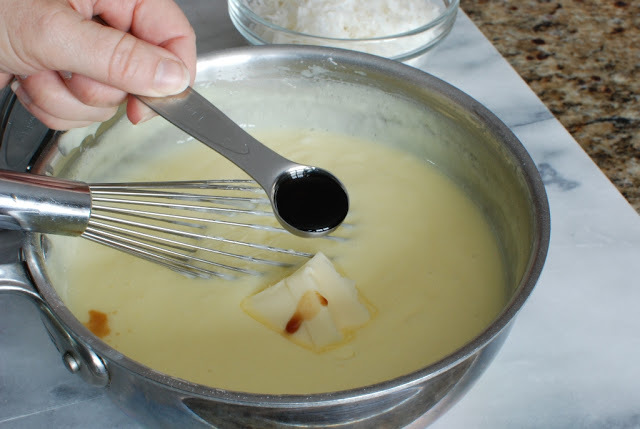 Press the plastic wrap against the custard. 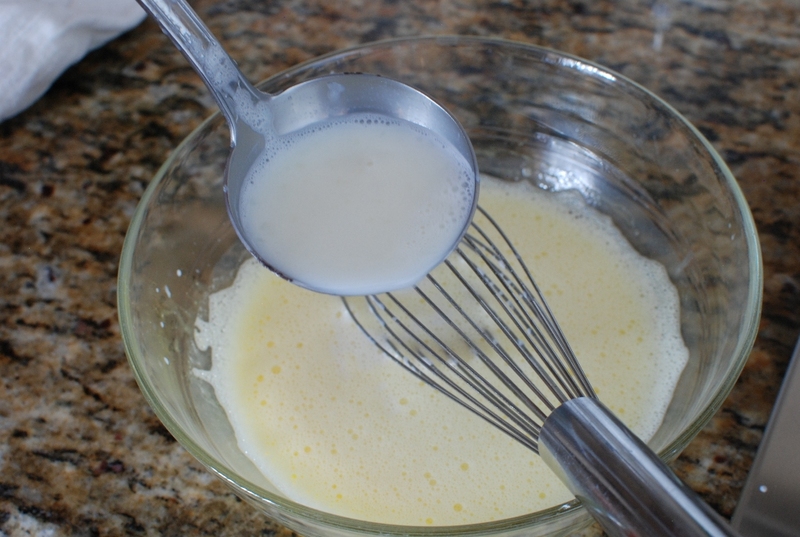 This will prevent a skin from forming on the custard. Refrigerate pie until completely cold. I like to let it set at least 5 hours or over night. 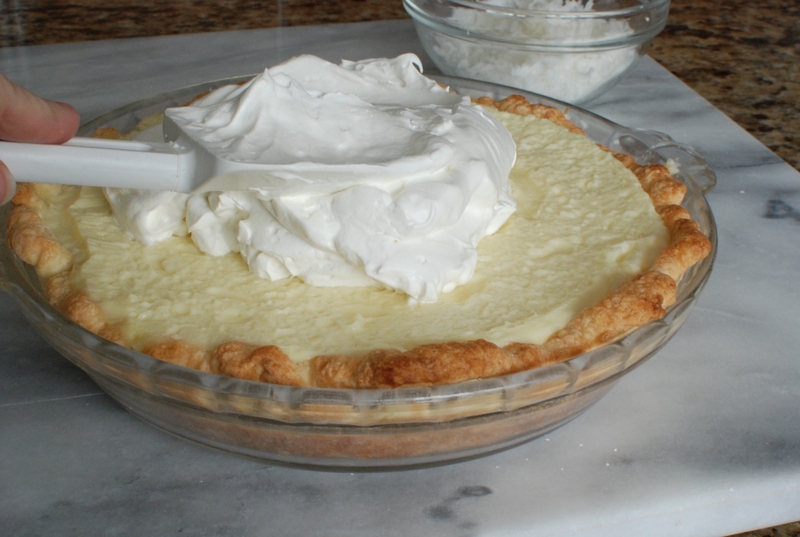 When the pie has completely cooled, make the whipped cream topping. 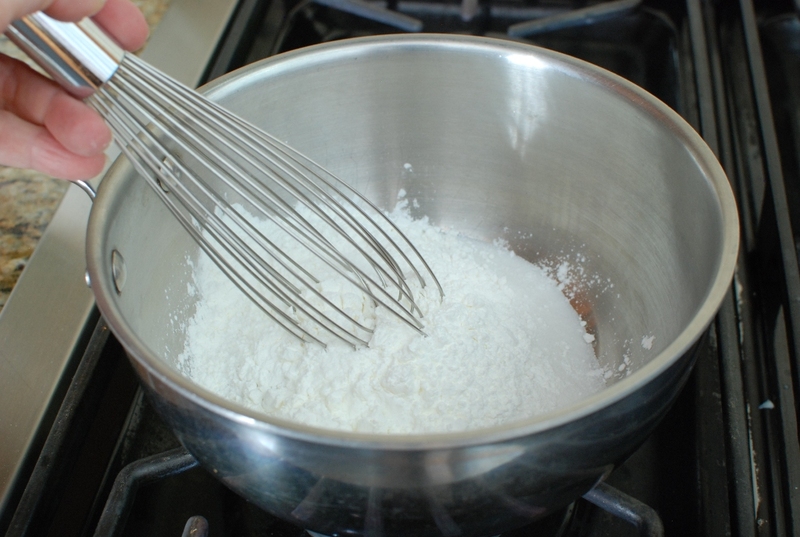 I just use a hand mixer to whip. 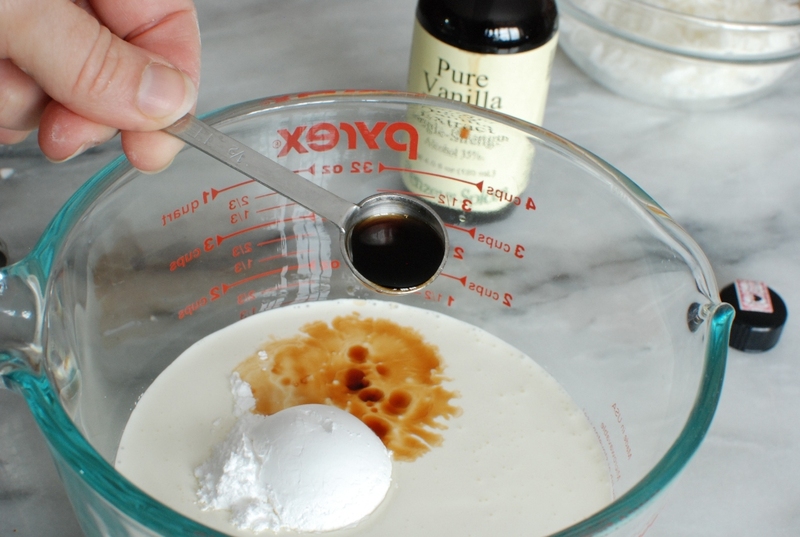 You can use whatever it is you use to whip cream. 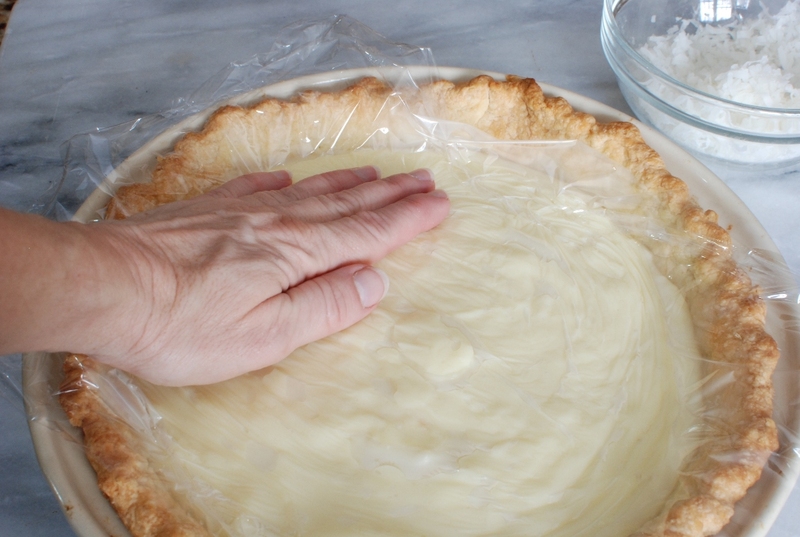 Remove the cooled pie from the refrigerator and peel off the plastic wrap. 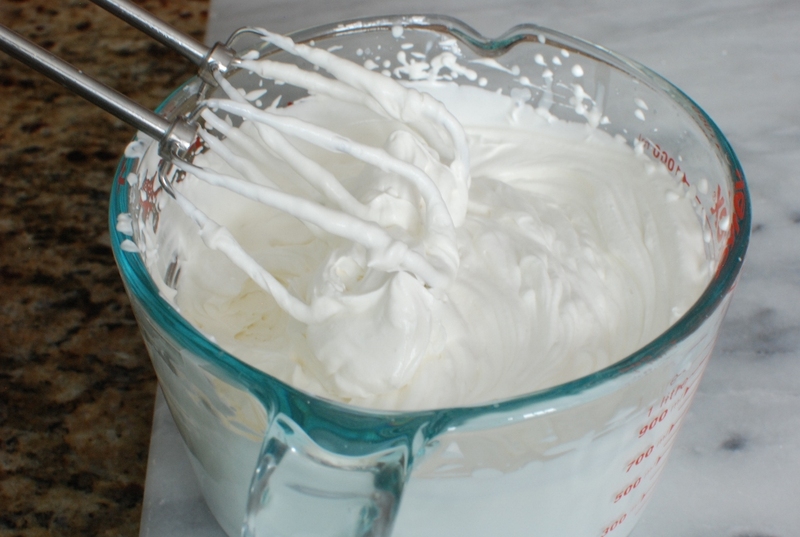 Spread whipped cream over custard. 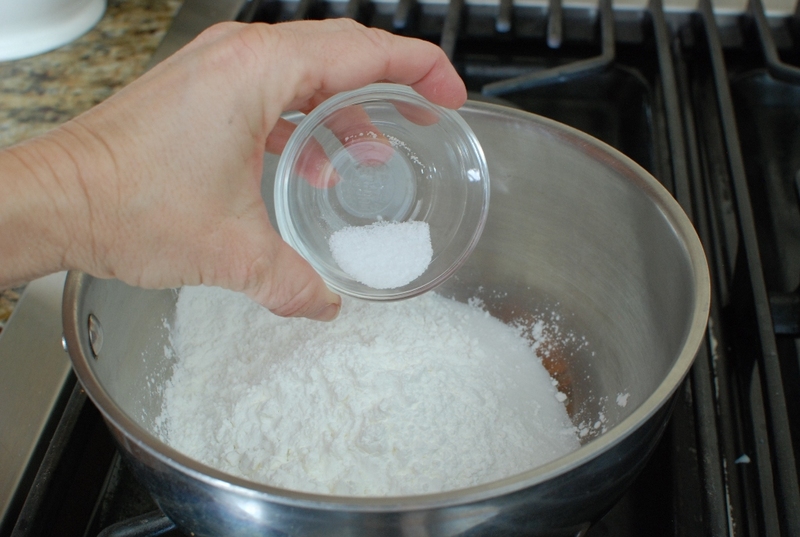 Sprinkle top with remaining coconut. 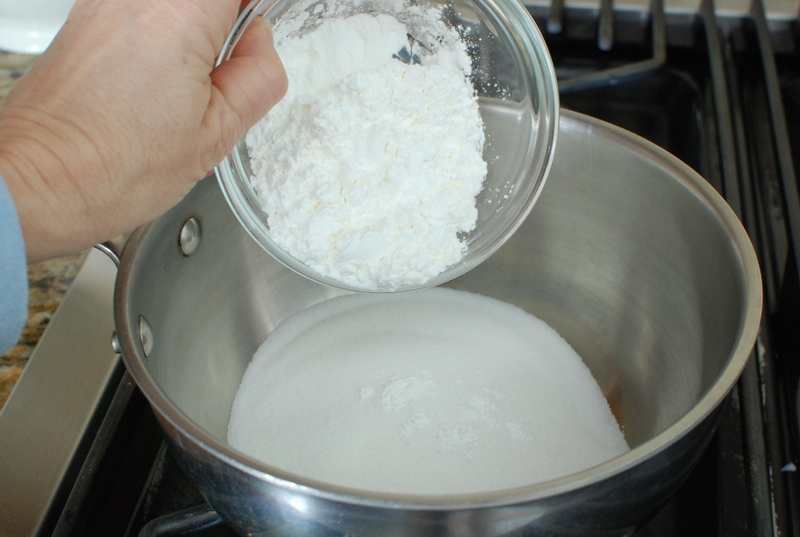 Mix cornstarch, sugar and salt in a medium size saucepan. 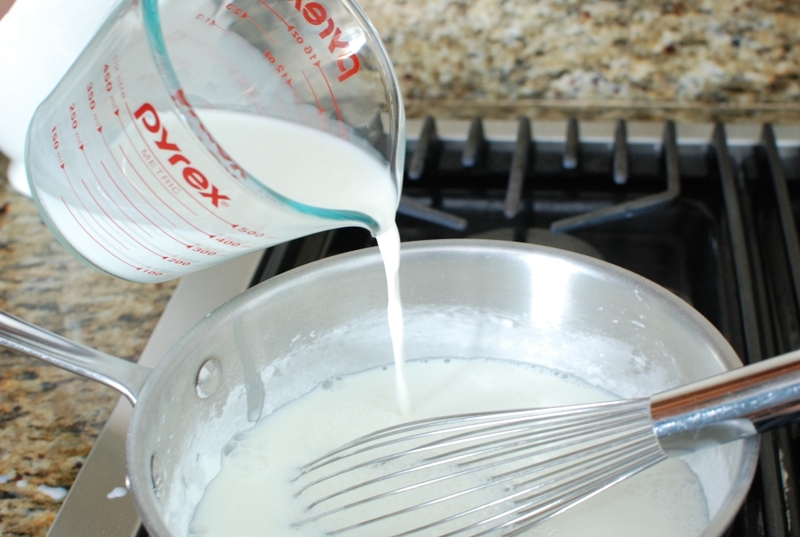 Add milk and cream and cook over medium heat until thickened, stirring constantly. Pour a spoonful amount of hot mixture into egg yolks; blend thoroughly. 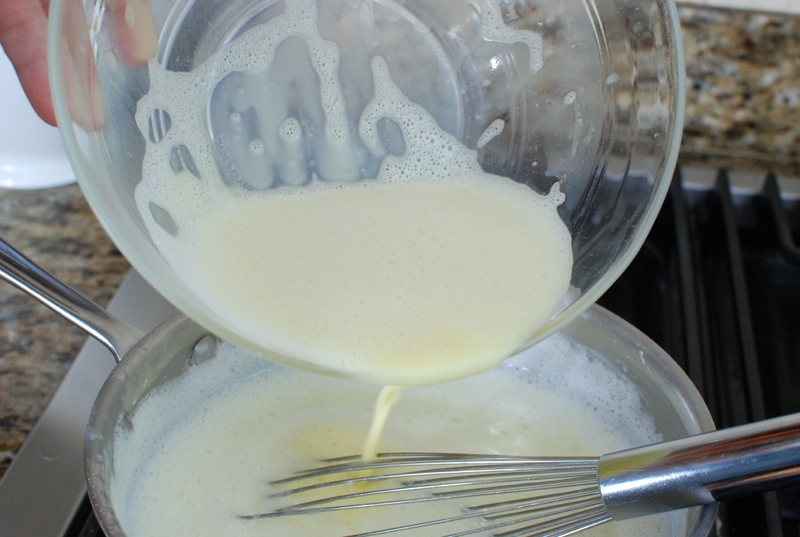 Add about 1/3 of the milk mixture to the egg yolks, then pour back into the saucepan. Cook another 2 or 3 minutes. 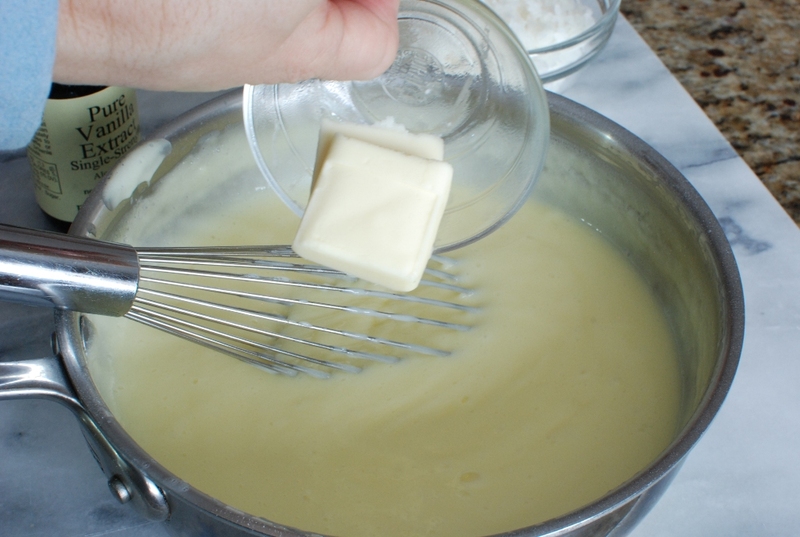 Remove from the heat and add the butter and vanilla. Stir in 1/2 cup of the coconut. 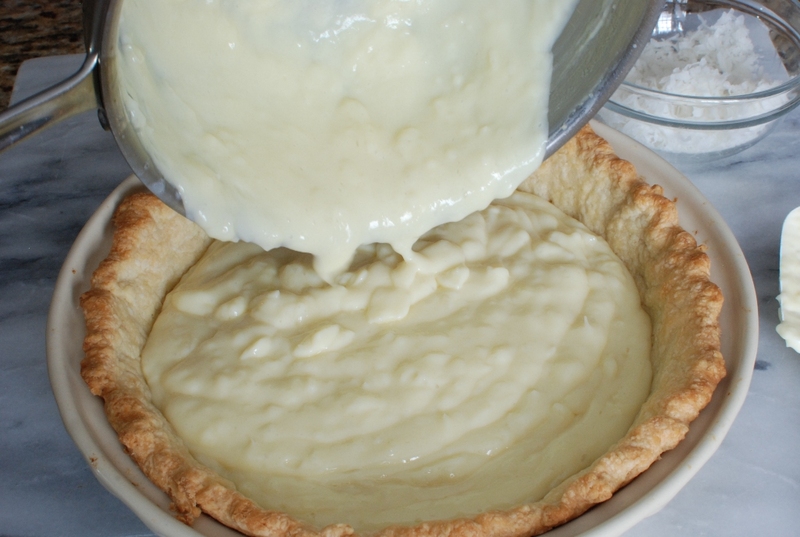 Cover with plastic wrap and press plastic against the custard. Refrigerate until completely chilled. When ready to serve, make topping by pouring whipping cream into a medium size mixing bowl. 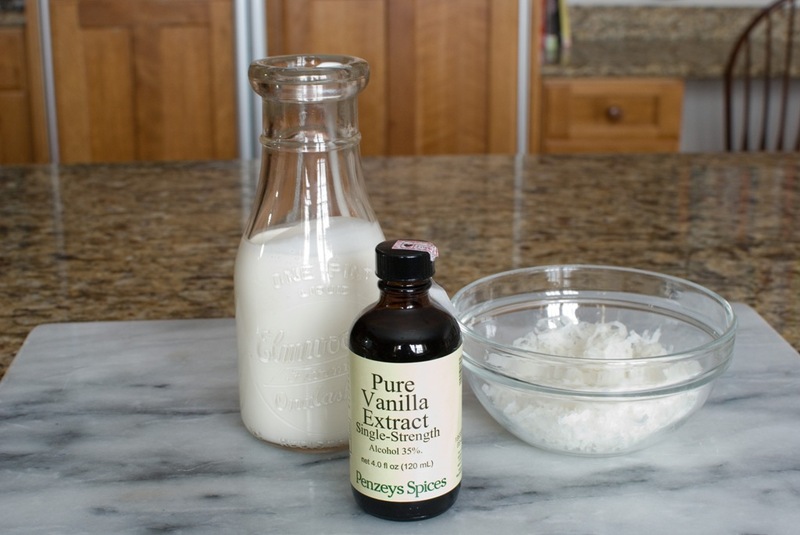 Add confectioner’s sugar and vanilla. Beat until stiff peaks form. 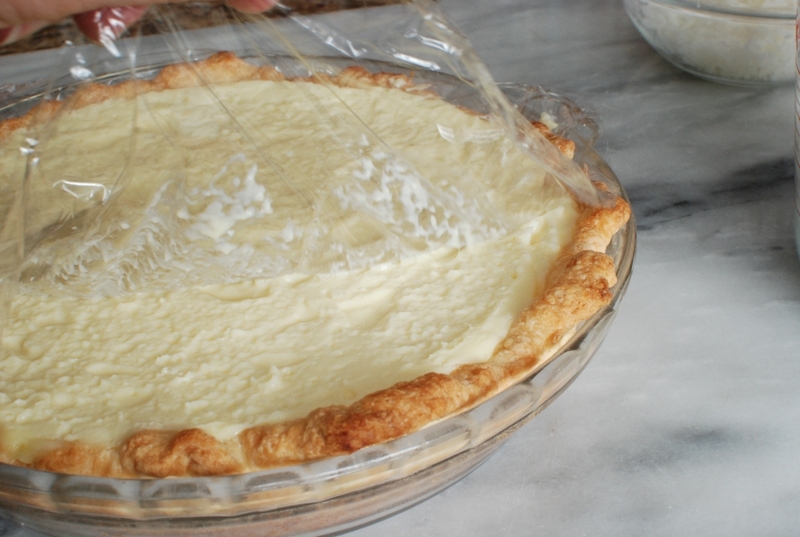 Remove pie from refrigerator and remove plastic wrap. 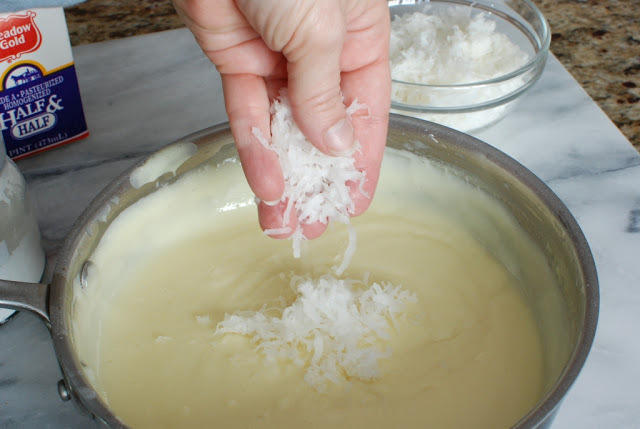 Spread whipped cream over custard and sprinkle with remaining 1/2 coconut. Serves 8-10 depending on how large you slice the pie. 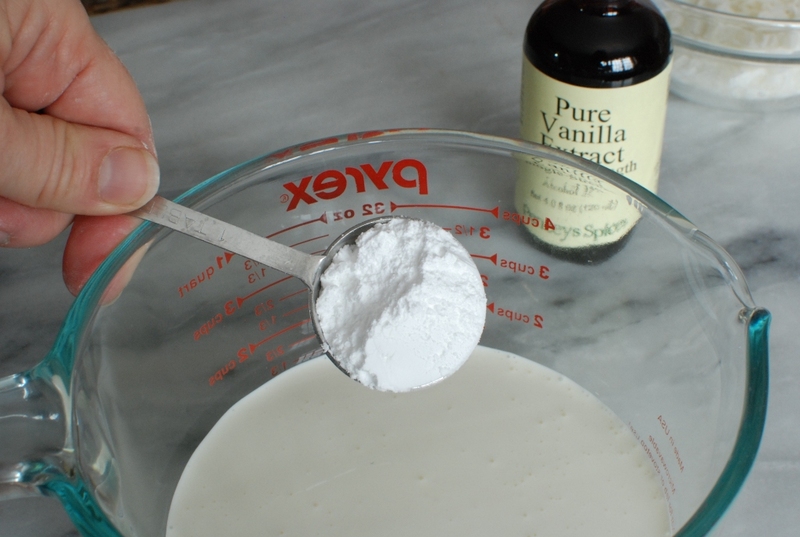 For chocolate cream pie: Reduce sugar to 3/4 cup and add 1 cup chopped semi-sweet chocolate to the milk and sugar mixture. Stir until chocolate is melted and mixture is smooth. Happy Birthday Grandma! Like always March came in like a Lion…go figure. 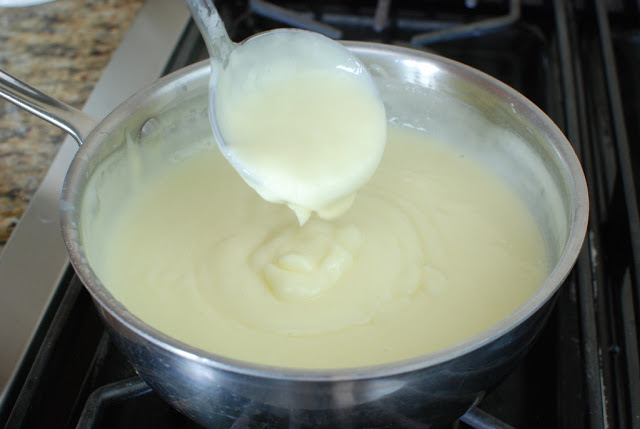 The custard sets up pretty stiff. I could be difficult to spread nicely into a crust, but it could be worth a try. Excellent cake! Is not difficult to make and is so impressive!I sprinkled the top of the pomegranate. Find it frm Pinterest. It looks yummy n easy to make. Wanna do it this weekend. Thank you for your amazing blog! Greetings frm Indonesia! 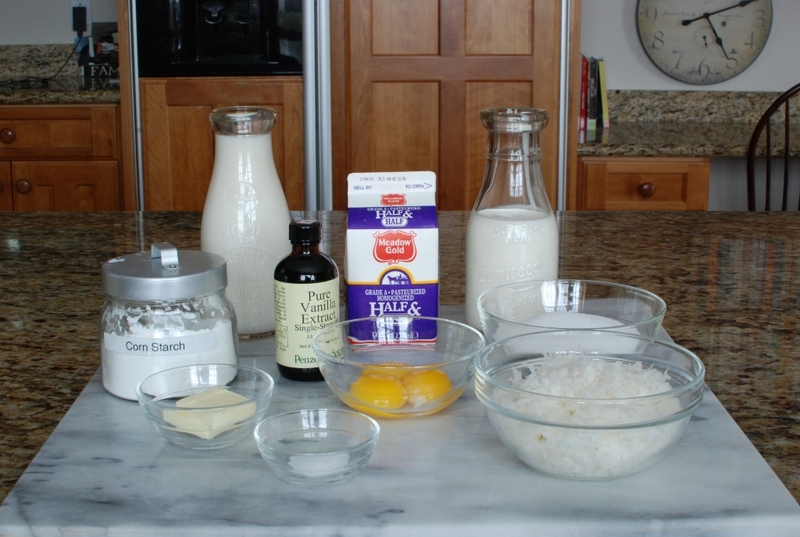 Find your Coconut Cream Pie picture frm Pinterest. It looks yummy n easy to make. Wanna do it this weekend. Thank you for your amazing blog! Greetings frm Indonesia! Janet, this looks divine. My mom lives in Sandy. It is a great place. I love Sandy. You will have to tell me your mom's name. Maybe we have crossed paths. So fun. 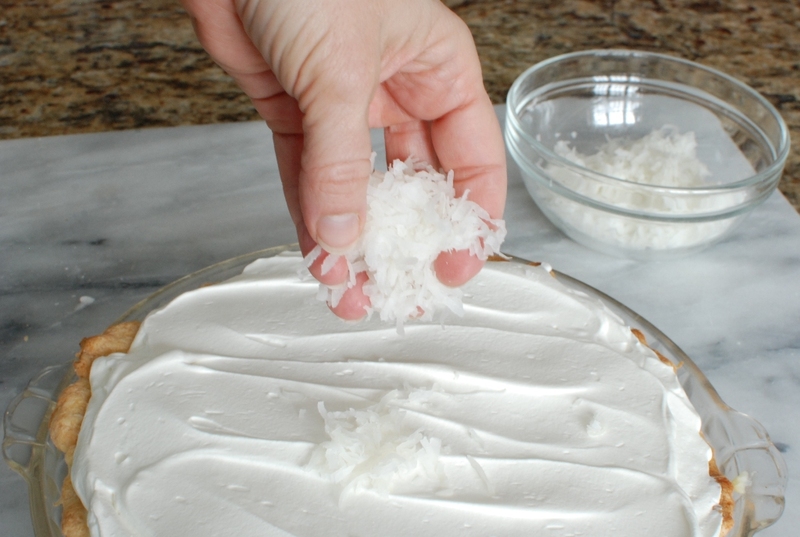 Love, love, love coconut cream pie! This looks amazing! Can't wait to try it! I think this would be great for Easter. I hope you try it soon. P.S. My parents live in Sandy! I'm so glad you found me. You will have to tell me who your parents are. I hope I know them. Bahhhhh!!! Thank you Lisa. One for commenting so nice and two for reading this blog. I'm sure your pie turned out beautifully. Let me know. I miss not seeing your or chatting. I should visit the sisters in Relief Society sometime…or not. Janet, I love your blog! I so enjoy the pictures, the recipes, the step by step instructions but most especially your witty quips! 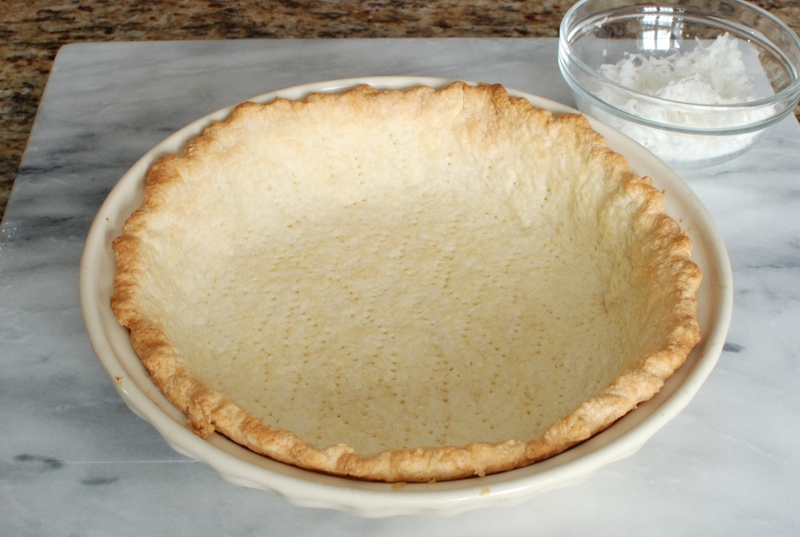 I am making this yummy pie today, right now, this morning! I'll tell you how it turns out!! Aarthi, you are the best!